Inventory We are a resale marketplace, not a box office or venue. Ticket prices may exceed face value. This site is not owned by Daily's Place Amphitheatre . The Daily’s Place Amphitheater is a conjoined effort with The City of Jacksonville and the NFL franchise Jaguars. Opening for its first concert series in 2017 Daily’s has some serious talent lined up with Dave Matthews, Third Eye Blind, and Zac Brown Band. 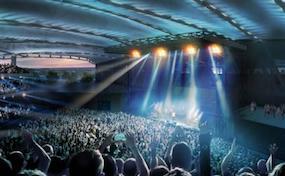 Daily\’s place will offer 5500 seats as well as more luxurious seating options. The Bud Light Party Zone at Everbank Stadium will be linked to both venues. Jacksonville is fortunate to have another option for concerts and outdoor entertainment. AmphitheaterJacksonville.com is not affiliated with any primary box office or supplier. We are a privately owned and operated business specializing in sales in the secondary market. To buy tickets for any Dailys Place Amphitheatre events in Jacksonville simply click on the event of interest or call our operators at anytime.